Celebrate the wholesome source of butter with this stoneware dish shaped like a happy Holstein. Hand formed from stoneware with glazed details, Marjorie the cow is an endearing representative of all hoofed milkmaids, nestled on a serrated green dish suggestive of her pasture. The largely unglazed outside of the cow provides a no-slip surface for your fingers, while the glazed interior and dish provides a sanitary, easy-to-clean environment for your butter. Handmade by Becky Ziemer in Memphis, Tennessee. Lid: 6.75"" L x 2.5"" W x 2"" H"
Perfect butter dish for Vermont farm home! We loved this unique gift! I bought this butter dish for myself because I thought it was so whimsically charming and her face resembles the faces of some sheep and cows that I had bought quite a few years ago. Every time I use it, I have to smile. This butter dish is so cool! 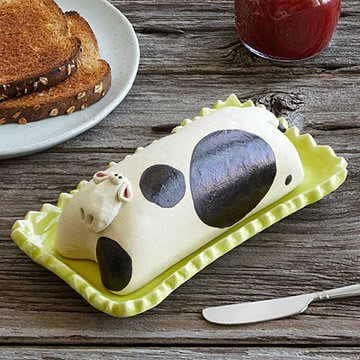 I love this cow butter dish. It is very whimsical but also functional. It makes me smile every time I look at it! I cannot answer most of the questions as I've not seen the actual product, but our daughter loved the dish. She has always liked cows and this was a perfect surprise for her. I love this butter dish; it's cute and functional! Everyone that sees it strikes up a conversation. I thought it so cute that I couldn't pass it up. I've also bought several other items from UG. I bought the product as a Christmas Gift as I have so many years. I'm always confident that the gifts are quality and shipping is always on time. I really don't have any negatives! My wife loved it as a Christmas present. Celebrate the wholesome source of butter with this stoneware dish shaped like a happy Holstein.